L'expérience de la paix, la tranquillité et de la faune du Saguaro Park West ... Ce 3 chambres et 2 salles de Santa Fe maison de style est situé sur 2 acres de cactus saguaros maturité, Ironwoods arbres, ocotillos cactus, cactus cholla, Palo Verde & arbres arbres de mesquite. Vues des montagnes de Tucson, de la faune et des vues imprenables, levers et couchers de soleil. Situé sur le côté ouest des montagnes de Tucson, la maison se trouve à 5 minutes du musée de désert de Sonora et à 10 minutes de Tucson Studios (Old Tucson) et à 30 minutes du centre-ville de Tucson. Ceci est une merveilleuse maison de vacances pour se détendre et profiter de la nature! Les rues transversales les plus proches sont Mile large Sandario Route et. Vous pouvez mapper quête de l'intersection d'un emplacement approximatif. Découvrez la nature, les montagnes, cactus, ciel bleu et le soleil, cheminée Beehive, cuisine entièrement équipée, jardin maître baignoire, garage 2 voitures. La maison est parfaite pour séjours de vacances, les amoureux de la nature, détente, visites retraite maison de chasse, et l'hébergement temporaire exécutif délocalisée. Un rêve devenu réalité pour les amateurs désert de la nature! Mots-clés: Saguaro, Ouest, Tucson, AZ, Santa Fe Style Home, AZ, maison de vacances, vue sur la montagne, désert Sonoran, isolé, musée du désert, propriété, faune, Lever du soleil, Coucher de soleil, Monts Tucson, Paix, calme, privé . Quiet, lovely area and property west of the Tucson Mtns. wendy j.Where do you live? We were very pleased with our accomodations. Olivia was very helpful prior to our arrival, answering all our questions. Unfortunately, we had to leave 4 days into our stay due to an emergency. And unfortunately, the trip cancellation insurance that we had purchased via VRBO did not reimburse us. We were told that it only applied if we had to cancel BEFORE arriving. Very frustrating! I just want people to be aware of that. Not any fault of the property owner. Would recommend this property to anyone who enjoys quiet and the beauty of the desert. Thank you, Olivia. My family of six, including husband, two adult daughters and grandsons, 7 and 9, enjoyed a terrific desert experience for 6 days. The house accomodated us perfectly. All the kitchen gear we could have asked for were provided, including a cooler and thermal bag for packing lunches. We appreciated having an ice maker, too! Beds were comfortable and both bathrooms were well equipped. The boys enjoyed exploring the desert right outside the front door and watching quail and rabbits. The weather wasn't terrific but we certainly made the most of our time together. We were visiting our family scattered all over Tucson but had opportunities to take advantage of adventures at the Sonoran Desert Museum, Saguaro National Park West and hiking in the Tucson Mountain Park. We came prepared with essential groceries but were out and about to access grocery stores as needed. Olivia was a great communicator and provided info when requested. We had a wonderful family time in her beautiful, spotless Desert Oasis. Very comfortable home in glorious desert setting. Spectacular sunrises and sunsets with glittering starlit evenings, Kitchen was well equipped with items needed such as spices, coffee and creamers. Excellent signage and directions to destination. Pictures in website were truthful representation of home. We got just what we wanted, a picture perfect Arizona desert experience. Superb House in a Superb Location! Wonderful house and very well equipped. All the advantages of adjoining Saguaro National Park. Javelinas, hawks, go to sleep with coyotes howling in the distance. All the best desert flora right outside your doors and windows. The house is very quiet and comfortably furnished (tempurpedic mattress in the bedroom, excellent crockery and cutlery. There is an outdoor propane barbecue and a blender for margaritas. The owner, Olivia, is never intrusive but always an email away I you need anything. This as the best experience we ever had with VacationRental. We will definitely be back. This property was fantastic! We wanted a quiet place to go after a long day of filming and this was just the right place! Very private, close to some great hiking trails and just a 30 minute drive to the city. Amazingly clean! The cleanest rental that I have ever stayed in. The renter’s manual was very thorough with information on the home and nearby activities. The master bedroom is very large and there was plenty of closet space in each bedroom. The kitchen is very organized and functional. I would definitely recommend this property and I will definitely try to stay there the next time we are in Tucson. This is the second time my husband and I have stayed here. The house is wonderful. It has everything you could possibly need. It is clean and comfortable. 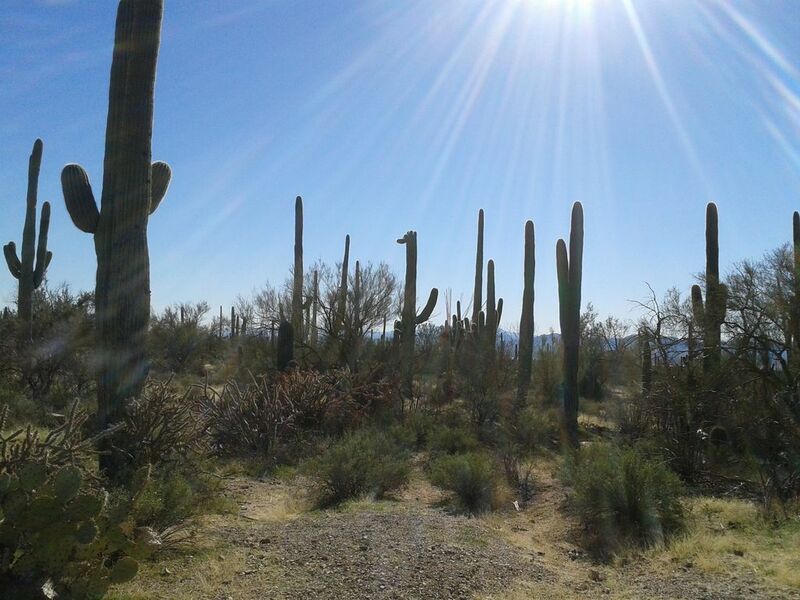 The location is very close to Saguaro NP West and there are many hiking opportunities within a 10 minute drive. It's quiet and peaceful. We enjoy having breakfasts and lunches outside on the patio. There are lots of windows and light, which is important to us. The kitchen is well stocked. We eat most meals at home. I would highly recommend this home if you want to be on the west side of Tucson. Cinq minutes de Sonoran Desert Museum, dix minutes de Old Tucson Studios. Marjor Streets Cross Mile Road et Grand Sandario Road, si vous avez besoin de la carte où il est à Tucson.